We’re experiencing a heat wave and I couldn’t think of a better way to cool off after school than with some creamy Vegan Strawberry Banana Ice Cream! Strawberries and bananas go so well together! My family loves frozen treats and when my kids get home from a busy day at school, I prefer to give them healthy snacks as they prepare to do homework. Nothing worse than having a mountain of homework and suddenly crashing from a sugary snack. Makes it so hard to focus and get the work done! One of my kids has a slight sensitivity to milk products, so whenever possible, I look for alternate ingredients. I’ve made a similar ice cream in the past, but it had cream in the recipe so I tried making it with coconut milk instead and it worked perfectly! Not only is this recipe vegan, its also Paleo friendly! In a professional grade blender (like a Vitamix), add the strawberries and banana. Flip the refrigerated can of coconut milk and open. When cold, the cream and the liquid will separate. Pour out the liquid and scoop out about a 1/4 Cup of the coconut cream, and add to blender. (Save remaining coconut cream and liquid for future use.) Begin blending on a low variable speed and slowly increase the speed until the fruit blends and starts becoming creamy. If the consistency is too thin, you can either add small amounts of ice cubes and blend until it thickens, or you can add additional frozen strawberries, bananas or both! Sometimes, strawberries aren’t sweet enough so you can add a bit of organic honey to your mixture. The amount will depend on how sweet you want it to be. Once the mixture is thick, like ice cream, stop blending and serve immediately! Disclosure: I received complimentary samples of Crunchies for review purposes. All opinions are 100% my own. 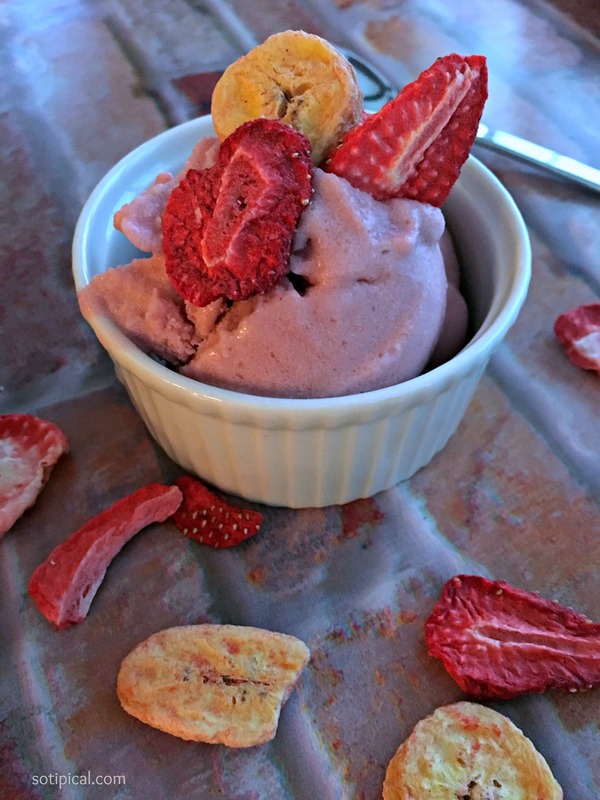 We like crunchy toppings on our desserts, so today I used Crunchies freeze-dried strawberries and bananas. I was recently sent a variety of Crunchies samples to review and this is just one of the ways we enjoyed them! Other varieties include Mango, Mixed Fruit, Beets and more! My kids ate some of them right out of the bag like chips! 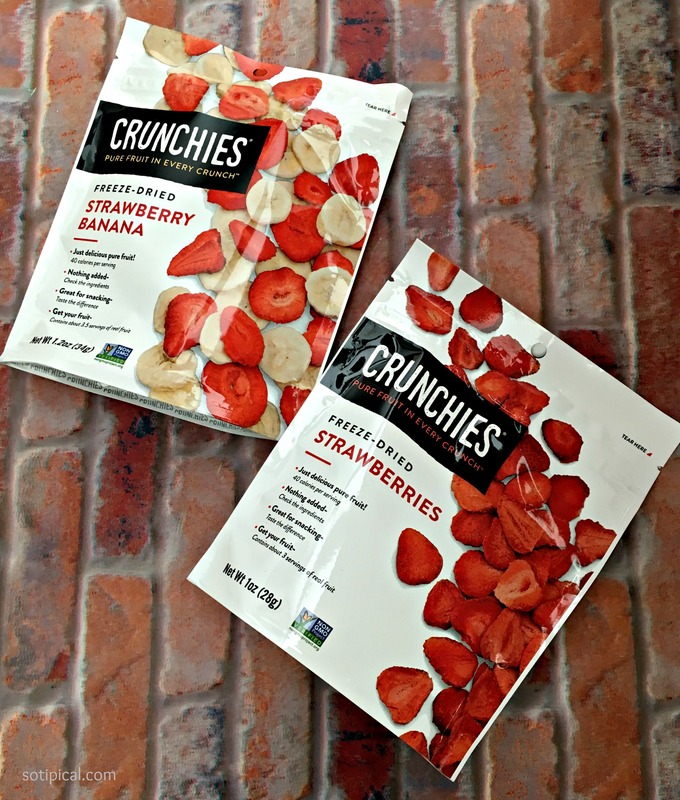 Crunchies freeze-dried snacks are made with just one simple ingredient – fresh fruit – and make the perfect low-cal, gluten-free, all-natural addition to smoothies, acai bowls, sorbet and more. This ice cream can also be made with Mango instead of Strawberries! Just substitute with 2 cups of frozen mango chunks and prepare the same way. Top it with Crunchies Freeze-Dried Mango! I made it and it was so good! Sorry, it disappeared before I could take a picture! Look how I served the beets! 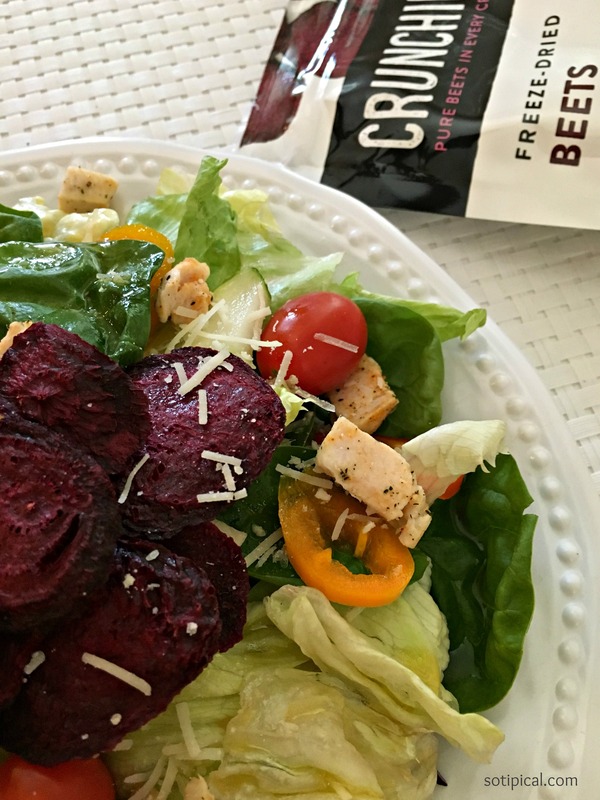 This salad has grilled chicken and a yummy Honey Vinaigrette dressing, topped with Crunchies Beets! YUM! So many possibilities! How would you enjoy Crunchies and which would you try first? Tip: If you make a double batch, transfer to a serving container and freeze up to 30-60 minutes, MAX, before serving. If you keep it in longer, it will freeze solid and you don’t be able to scoop it. I had this happen and it doesn’t really soften to where you can scoop it. The outer edges begin to melt. Its really best to serve right after you make it.